The Seven of Cups are standing for the waters of delusion, the clouds of intoxication, the emotional waters are rotting in the depths of destiny, they have fallen from the grace of Tiphareth. 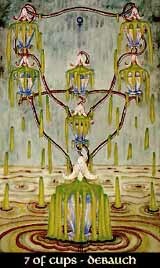 In its best aspects, the Seven of cups is a warning to recognize the delusion, the disguises, to get rid of the intoxicating feelings and face up the facts. Netzach is not only anarchy, but creativity - so the realization of the bad can lead to something good when used with care. Drive: Delusion, desire, ecstasy, neutralized victory, illusionary success, lying error, promises unfilled, drunkeness, violence, selfish dissipation, deception in love and friendship, success often gained but not followed up.